Posted: Monday 15th April 2019 in News, Performance Marketing, Retail Strategy, Thought Leadership. Easter is of vital importance to sales in the annual retail calendar. It contributes significantly to retail by offering consumers free time to shop and leisure time to enjoy spending time with family and friends. But how can retailers plan effectively when Easter moves each year? What impact does a two-week shift in Easter have on sales? We used Summit’s new technology, Purchase Predictor, to look at historical trends to try and find some answers. 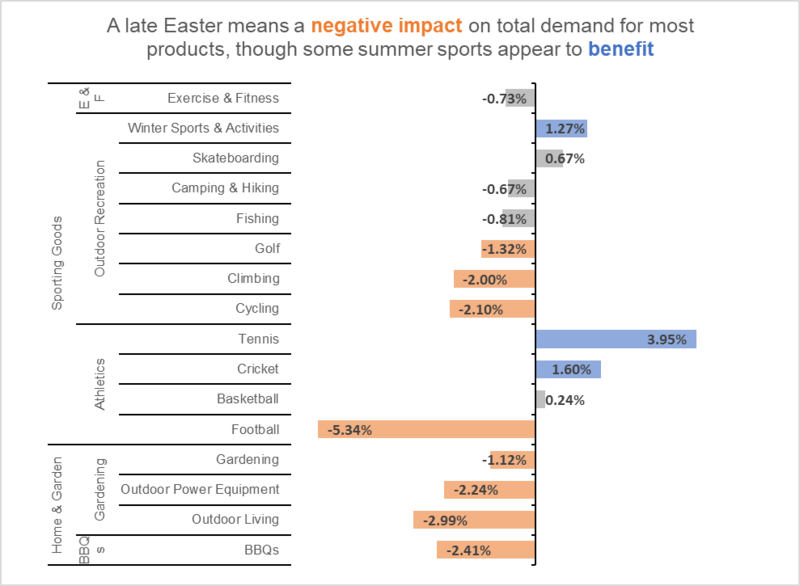 We analysed market demand data across the last 15 years to understand the impact that a late Easter (as we are seeing this year) has on annual demand for two very different retail categories: Sporting Goods and Home & Garden products. It is easy to assume that the demand merely gets reapportioned to elsewhere in the year but that is not what we found. 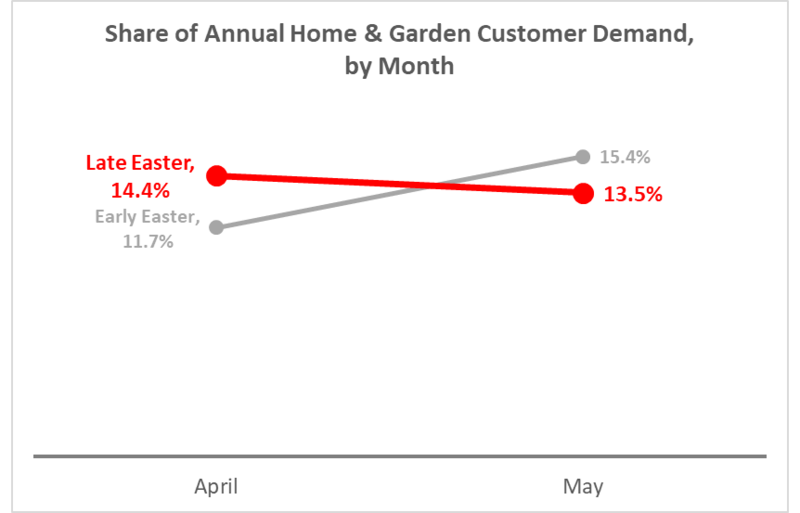 The graph above demonstrates that nearly every sub-category within both Home & Garden and Sporting Goods will see a negative impact on their annual demand as a result of a late Easter. Why is this? Retailers don’t benefit so much from the Mayday Bank Holiday as it occurs so closely after Easter. The spring/summer ranges don’t fit as obviously into stores or online and the sale of winter goods lasts longer. This means retailers may start to panic and launch discounts early to avoid ending the season with warehouses full of unsold stock. When we looked at the historic sales figures for a specific retailer selling products within these categories, we calculated an £8m growth opportunity across Sporting Goods and Home & Garden. 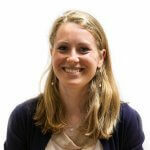 This indicated a total £15.1m incremental spring opportunity as a result of Easter occurring two weeks earlier. Having looked at data from the last 15 years, an Easter occurring mid-way between ‘early’ (3rd week of March) and ‘late’ (3rd week of April) had the most overall positive impact on demand. This graph shows the percentage of demand for Home & Garden products across April and May. We can see that the biggest variation in demand occurs when Easter falls early. In April, demand is considerably lower during a year with an early Easter (11.7%) and instead sees demand surge in May up to 15.4% and remains high throughout the year. However, in a year with a late Easter, demand peaks in April at 14.4% and drops to 13.5% (2% lower than when Easter falls earlier, and this trend continues throughout the year. This shows that a boost in April demand is not indicative of annual demand. In summary, retailers should in theory perform best when Easter falls mid-way between ‘early’ and ‘late’ to maximise their sales opportunities, but most importantly retailers need to be able to change their plans according to when Easter falls. This will ensure they get the most out of key calendar events throughout the year to hit their sales potential in line with demand peaks in the market. Discover what headroom you are leaving on the table with our technology, Purchase Predictor.